Is it easy for others to get under your skin? Do you react when someone makes comments that conflict with your beliefs? Do you respond? Do you ignore the comments? What about infringement on your personal space in a crowd? Do you move aside? What about the traffic challenges when someone forces their car into your lane taking up the space your allowed for safe stopping? Or lineups at self-serve gas stations when the price of gas drops and cars juggle for a spot near to the pumps? Some days it’s hard not to react to other people’s behaviour. While standing in a checkout line in a hardware store at noon today, I was shocked when a woman pushed past me to grab a spot directly in front of where I stood in the lineup. I said nothing but felt myself fuming inwardly. I then watched her move to get in front of another woman who reacted with a string of expletives. A loud argument ensued as other customers got involved. I looked for another lineup but there was only one open cash register. I put down the things I was about to purchase and left the store. This interaction stayed with me through the day. I felt violated. I felt unsettled. I wondered why someone else’s behaviour could unnerve me. When the woman pushed past me in the line up, I was affronted by her behaviour and shocked by her bad manners. When the arguing began, I was disgusted by the hostility between the women as well as the gutter language. Their anger had a contagious effect on everyone in the store. The event made me think about strategies for dealing with other people’s negative behaviours. How could I have kept this from getting under my skin? Remember that you are in charge of you. You can control your thoughts, feelings and reactions. I was proud that I did not get outraged when the woman pushed past me. Although her negative behaviour affected me and left me unsettled, I controlled my response instead of getting involved. Own your power. When you react emotionally, the other person wins. You feel miserable. There will always be someone jumping a queue while waiting for a cashier, cutting you off in traffic, or making a nasty comment. If you react, you give away your power. You lose track of your higher self. You also reduce yourself to their level. Keep your happiness instead of allowing others to change you for the worse. Negativity affects your emotions and drains your energy. 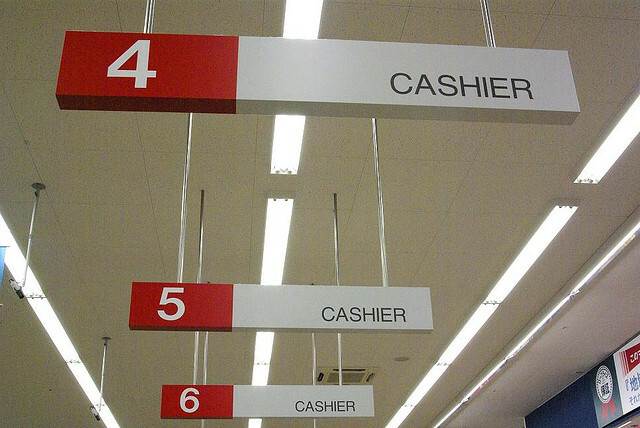 There was nothing that I could do to change the event involving the cashier’s line up. By leaving the store, I kept myself from getting involved or watching the escalation of inappropriate behaviour as the women yelled at each other. The argument wasn’t about me; it was about them. Choose a positive approach even when faced with someone who is disrespectful, angry or aggressive. It’s easy to get riled up and react emotionally to bad behaviour. Rather than get involved in the argument, I avoided escalation by walking away. Another strategy to keep control is to take a few breaths before responding with words that could cause regret. I did not use breath control to keep my cool but avoided the situation by walking away. Look for the humour in the situation. As I write this post, I think back to how silly these women looked arguing over a spot in a cashier’s line-up. How they behaved is their business but how they looked to others is material for reality television. Although I was mostly successful in not letting this retail incident get under my skin, it did affect me. The behaviour was offensive. Initially I felt like a victim as I had lost my spot in the line-up. I was repulsed by the subsequent arguing and the language of both women. I was also disappointed as I had come home without my purchases. Everyone lost something today — business, respect, time, energy.